- 【Custom Homescreen】User-defined main interface. You are the master of your world and life. 1.3 inch 2.5D Curved color screen, give you an unparallel visual experience. - 【Special physical button & 8 Sports modes】Press the physical button you can return to the homescreen directly. Long press the button you can go into running mode. Sports modes has swimming, basketball, badminton, football, running, rope skipping, walking and bicycling. - 【Unit Conversion ﹠IP67 waterproof】 supports Metric/Imperial system and ℃/℉. You can wear it to take a shower(NO HOT WATER), wash hands, or swim in the depth less than 32.8ft(10m) area. 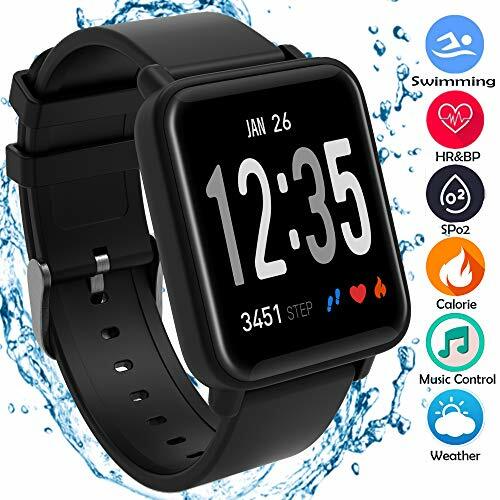 - 【Multifunction】Blood Pressure, Heart Rate, Blood Oxygen, Sleep Monitor, Sedentary & Drinking reminder,Music control, weather forecast(today & tomorrow), brightness adjustment, alarm clock, tic watch, remote shutter, message reminder(facebook, whatsapp, twitter, instagram, etc), call reminder, call object, silent mode. - 【Wider Compatibility】Compatible with IOS 9.0 and above & Android 4.4 and above smartphones (not for tablet or PC), please install the App' Da Fit 'in your phone and pair the device from it.